Samsung today unveiled two new fitness wearables: the Gear Fit 2 wristband (pictured above), and Gear IconX cord-free wireless earbuds. As the name might suggest, the Gear Fit 2 is the successor to 2014's Gear Fit. The wearable sits in the fitness category, but nonetheless takes some inspiration from smartwatches thanks to robust notification support. In addition to the typical fitness metrics you'd expect to see (steps, sleep, distance travelled, calories burnt), the Gear Fit has GPS for runs and a heart rate monitor. 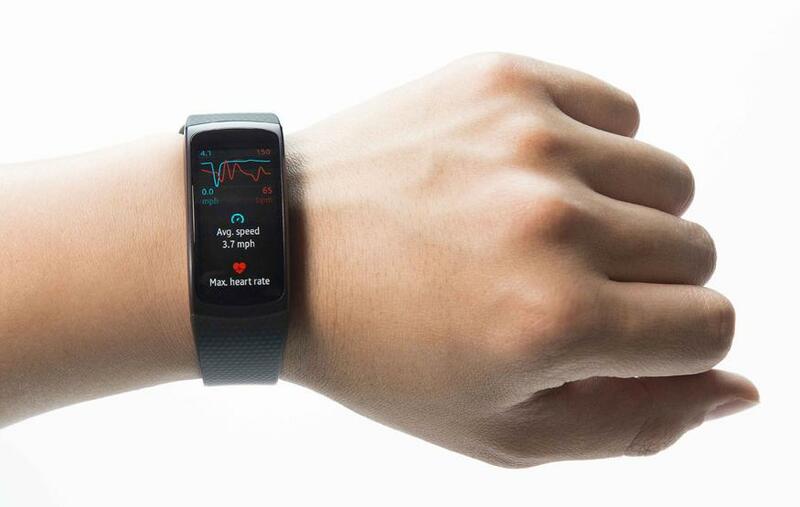 Much like newer Fitbit trackers, Samsung's latest wearable can automatically detect and log activities including running, walking, cycling, and work outs on elliptical and rowing machines. In terms of smart functionality, the Gear Fit 2 also works a standalone music player with 4GB of storage for tunes. Alternatively, users who keep the band paired with their smartphone can stream music through a native Spotify app. The Gear Fit 2 has a 1.5-inch curved display (a little reminiscent of the Microsoft Band 2) and is rated IP68 for water resistance. Samsung says the Gear Fit 2 will last three to four days per charge. The Gear Fit 2 is compatible with Android devices running KitKat or better, provided they have at least 1.5GB of RAM.